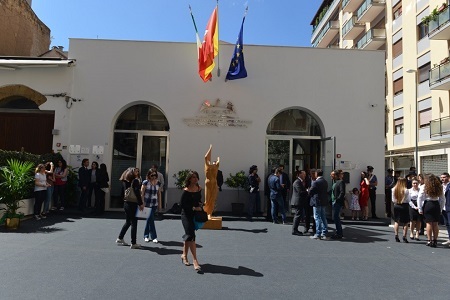 The Euro-Mediterranean Institute of Science and Technology (IEMEST), a not-for profit, autonomous organization for research located in Palermo, Italy, moved to new headquarters on June 13, 2016. 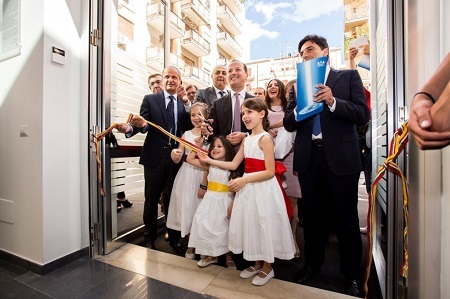 Ribbon-cutting by IEMEST President Prof. Bartolomeo Sammartino and his daughters. Palermo is one of the most important cities on the island of Sicily, Italy. It is a burgeoning metropolis of nearly one million people, not counting the many smaller communities in its vicinity, with a very rich cultural patrimony accumulated in the course of more than 2,500 years of existence, encompassing wonderful examples of architecture and various other art forms, and a renowned gastronomy. Some of the most endearing characteristics of Palermo, and of Sicily in general, can be appreciated in the photograph of the Palermo cathedral shown below: the peaceful atmosphere of a friendly environment; the bright blue sky and the intense natural light; the diversity of people; and the variety of styles of the building, reflecting the various successive cultures that predominated one after the other in the area over the centuries. 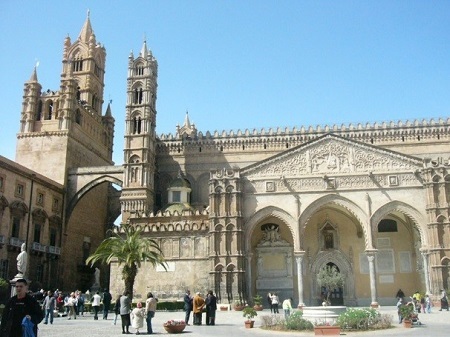 The cathedral in Palermo is a unique example of Norman Arab architecture blended with other styles added in succession over the centuries and, thereby, it epitomizes the long and rich history of the city. 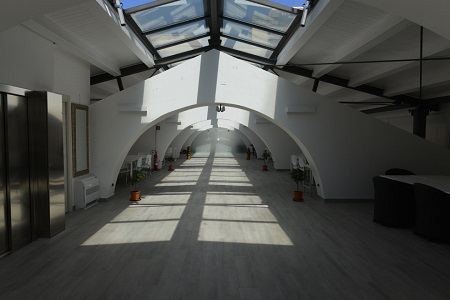 The new IEMEST building is the result of the restoration, upgrading and modernization of an ancient factory established more than a century ago to process citrus produce from Sicily. Many attended the inauguration, including leaders of various human endeavors. In a somewhat symbolic language one may say that this transformation of an old and venerable structure into a modern one was not simply an architectonic, mechanical so to speak, endeavor but elevated itself to spiritual realms. It was an effort that reached beyond the material toward the spirit and the culture that has enveloped Palermo and Sicily for many centuries and which, today, still permeates the scientific community at IEMEST. This strong impetus to move from the cultural and environmental patrimony forged through the centuries and elevate it to modern and sublime heights characterizes those that created IEMEST and are at the helm today and all who work there. The central aim is to jump from this rich regional history and tradition toward modern science and development in various directions, including scientific and technological innovation, with national and international relevance and connections. 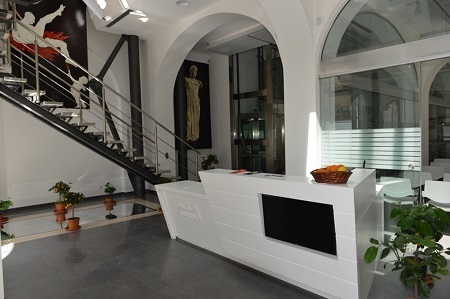 The main entrance hall displaying its welcoming and artistic atmosphere. One outcome of these physical and intellectual efforts, strenuous but fruitful, has been the recognition of the Institute’s excellence in a variety of fields, from that pertaining to advanced medical research to those that encompass bio-agriculture, plant pathology, food quality improvement and safety, energy from renewable resources, and the protection of the cultural and environmental wealth. This effort and the already visible contributions by IEMEST members have unleashed a wide range of benefits for the society at large, many more than those envisioned at the beginning. Each one of them says IEMEST’s President Bartolomeo Sammartino reflects the beauty intrinsic in Plato’s words, kalòs kay agathòs (what is beautiful must be good, and vice versa). It is, therefore, natural that the ample spaces of the new building were conceived and are perceived not just as mere rooms with the last generation of scientific equipment useful for laboratory research, or simply areas for high level teaching but, most importantly, these spaces shine as if illuminated by the artistic magic of a new Serpotta, whose reflections seem to fall on the supporting structures made of steel (which inevitably subdivide the halls) and dissolve them into a continuum inviting the intellect to float toward infinity. The large spaces horizontally subdivided into imaginary segments by a series of arches that separate, but do not isolate, one section from the next also reveal the Institute’s policy of multidisciplinary exchange. Along the same lines, the roof of the new building is a glass dome that contrasts the gray and opaque shades of the cement walls, and opens the working areas to the sky, once again confirming that there is no limit to the efforts and imagination of the people at IEMEST to search for the new, starting from what is already known and the only real support for the adventurous, pioneer researcher. Because, quoting Socrates, a life without searching is not worth living, every small advance stems in one way or another from a re-evaluation, a modification, an analysis from a novel point of view, of something already there even if rudimentary or as a seed. This flexibility allowing multiple views and approaches was perhaps alluded to by Popper, maybe in a blend of rhetoric and irony, when he said something to the effect that science to be such has to resemble a building on stilts but not one erected on a solid, fixed rock. Top floor with it glass dome letting the Sicilian sun in and opening the mind to the sky. The online home of IEMEST can be visited by clicking here. Piazzetta Briuccia with the new IEMEST building in the background. 1) Measurement of chaperone levels in tissues and cells, and determination of chaperone localization in tissues and cellular compartments: Immunomorphology and topography; cytofluorometry. 2) Measurement of extracellular chaperones: In blood and other biological fluids and in extracellular vesicles (e.g., exosomes); isolation of exosomes from biological fluids (e.g., serum, plasma, urine, saliva, and cerebrospinal fluid) and from cell-culture medium; characterization of exosomes; determination of chaperones in exosomes. 3) Molecular biologic and genetic analyses: Detection of chaperone gene mutations and polymorphisms; qualitative proteomics. 4) Theoretic consultations: These are also accepted, for instance, to instruct physicians and laboratory pathologists on how to diagnose and manage any given chaperonopathy and what samples are necessary for analyses. 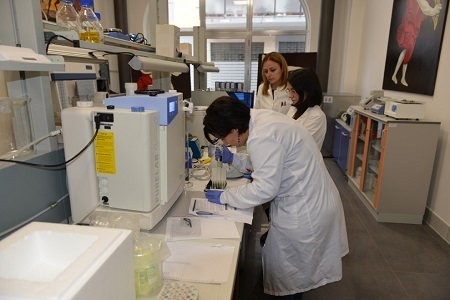 The Laboratory of Neuroanatomy (LoN) dedicated also to the study of chaperonopathies. In addition, other services are offered to private companies and government agencies, reflecting the ample scope of IEMEST and their aim to help society at large. 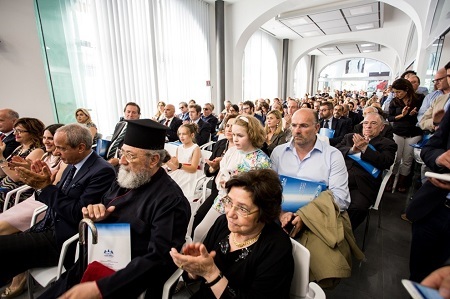 In brief, the services provided and the consultations that are received and worked upon encompass a wide variety of situations and topics, including scientific and legal issues, urban development, and preservation of the natural and cultural heritage. Some specific examples follow: a) Management of group dynamics; b) Organization of personal care; c) Implementation of genetic tests for disease diagnosis; d) Statistical analyses of data and decision-making reports; e) Right to work, civil and taxable; f) Protection, planning, and monitoring of the urban landscape; g) Protection, valorization, and promotion of tourism, cultural patrimony, and local and regional identifying characteristics; h) Specific questions about communication and marketing strategies and techniques; i) Preparation and revision of ethic codes and formation of ethic committees in commercial companies; j) Protection of trademark rights and intellectual property; k) Problems inherent to territorial planning in rural and urban areas; l) Monitoring, planning, and implementation of projects with components such as architecture, engineering, and design for urban and rural constructions. A complete list of services and expertise, with details, offered by IEMEST can be found on its website. Last but not least, another important aim at IEMEST is to develop interactions and partnerships with other scientific and academic institutions in Europe and beyond. Anyone interested is encouraged to contact IEMEST. These interactions ought to be seen as powerful incentives for developing grant proposals addressed to European and International funding programs, such as for example Horizon 2020. Department of Microbiology and Immunology, School of Medicine, University of Maryland at Baltimore; and IMET, Columbus Center, Baltimore, MD, USA. Euro-Mediterranean Institute of Science and Technology (IEMEST), Palermo, Italy. Department of Experimental Biomedicine and Clinical Neurosciences (BIONEC), University of Palermo, Palermo, Italy. Published in GI-Mail 03/2017 (English edition). Sign up for GI-Mail here. Tip: More up to date educational events can be found online in the Education Database »medicine & health«.